Bt. 11:00 and 11:20 a.m. Mountain Time, Robert F. Smith, a World War II bomber pilot, saw six unidentified flying objects about 10 miles west of Shafer Butte. Smith at the time was driving from Caldwell to Boise. Five of the objects were flying in a "V" formation at an estimated 13,000 feet. The objects were the approximate size of a B-29 aircraft, silver on top and dull on the bottom, and the shape of a half-circle with a point in the front. The objects were in view for approximately 5 minutes. 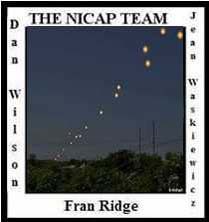 The five objects appeared to be in a descending spiral formation and seemed to be linked together because they remained in almost perfect formation. The objects then changed course and took off into the sky at high speed. No commercial or private aircraft were known to be in the vicinity where the objects were observed. Neither were military aircraft scheduled in that area.